It's back to school time and your either in the "Woop Woop! My kids need some routine because they are driving me crazy" camp or the "Boo-hoo! Summer can't be over yet camp". Which one are you?! Either way- ready or not- the new school year is about to begin! With a new school year comes a new grade, new curriculum, new supplies. And if you have a superhero fan like I do, he/she will want to be decked out in their favorite superhero gear on the first day of school! Growing up, back to school shopping was always a highlight marking the the end of our summer. My brother and I would go on a little shopping spree getting some new clothes for the new school year, along with new school supplies like pencils, trapper-keepers, and five-star notebooks! 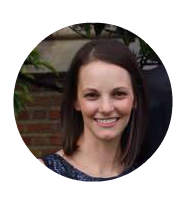 Present day, we take all of July off from our homeschool studies to enjoy the hot summer days, but with curriculum ordered and sorted out, new school supplies being bought, and feeling the summer brain drain... I am ready for some routine again. Since we homeschool, we gradually add in subjects to start off our school year to ease back into a routine of prioritizing school work. It has worked well for us the past couple of years. With the slow start, our official fist day is when our co-op begins for the year. Last year we marked that day with a special breakfast, new outfits, and new school supplies. 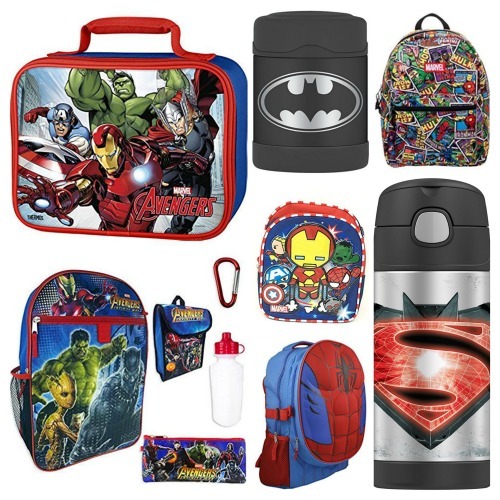 In honor of my superhero fan who was thrilled to show-off his new superhero backpack and lunch tote, I've put together some fun must have back to school basics for your little superhero! ... etc, etc! Add a fun superhero themed shirt or backpack to kick off the new school year! 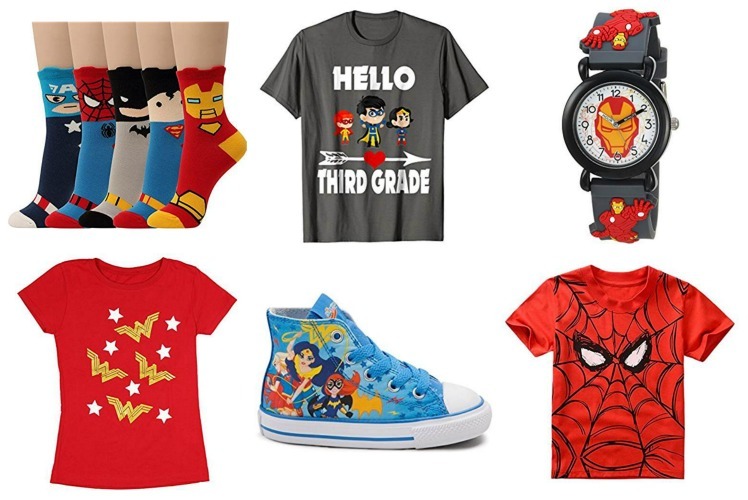 Spice up your little ones wardrobe with a fun superhero shirt, socks, or shoes! Going into 3rd Grade? This superhero shirt rocks! My daughter would love this Wonderwoman Girls Shirt paired with jeans! Have a little one that loves jewelry? Add this cute superhero charm bracelet! Show your superhero pride all year long with your favorite backpack and/or lunch bag! 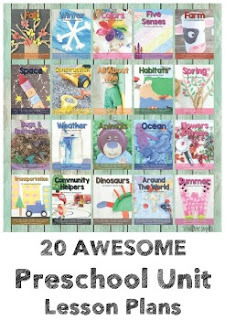 Have a toddler? He will LOVE feeling like a big kid with his own Marvel Toddler Back Pack ! I love this 3D Molded spiderman backpack ! Batman thermos will come in handy during the winter months! Marvel comic bookbag ; my son has this one! My son might think I am the coolest if I pack some fun superhero party napkins to use instead of paper towel! ha! Remind your little superhero just how awesome they are with these FREE Superhero Lunch Box Notes! 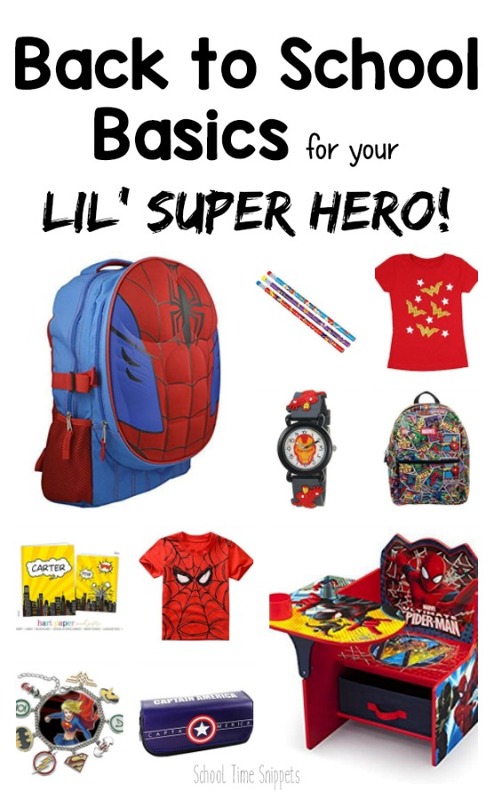 Fill your lil' superheroes back pack with more superhero goodies from pencils to stationary! 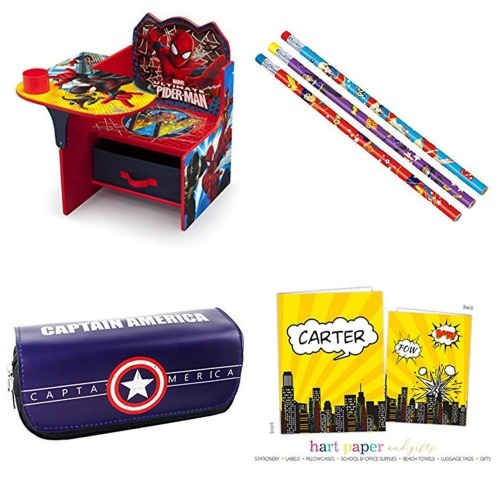 If you have a little one at home, he might like "doing school" at his very own superhero desk ! Oh man, your superhero fan is going to be thrilled about a new school year! Superhero gear and back to reality... I mean routine, back to school time is here!